Used for millenia in the Far East and prized for its strength, resilience and flexibility, bamboo features prominently in Asian architecture, furniture and in its musical instruments. And bamboo grows extremely quickly. Under the right conditions, growth of as much as 48 inches within a 24-hour period have been recorded, making it an abundantly renewable resource. Now Boston-based instrument company First Act has created the Bambusa, an eco-friendly guitar made entirely out of bamboo. Although not a completely new idea -- Yamaha came up with the FGBM-1 bamboo acoustic guitar in 2000 -- this is the first time that a solidbody bamboo instrument is being manufactured. Like the Yamaha, the only non-bamboo part of the instrument is the rosewood fretboard. And according to First Act, bamboo that is cut into strips and glued together to form a laminate, is stronger than maple and is a viable substitute for more common tonewoods. At a MSRP of $399, the Bambusa could make an interesting conversation piece at that next blues gig. Ok, now I'm thinking out loud. A 90-foot tall elm tree that was battered by a typhoon in 2004 and then destroyed by heavy rains in 2006 has found a new lease of life as an archtop guitar. The 300-year-old historic tree, which was awarded '100 Giants of the Forest' status in Japan, once stood as a proud symbol for the town of Shimokawa in northern Hokkaido. After deliberation by the town's council, it was decided that guitar luthier Naoto Odashima would be commisioned to construct a guitar out of the tree's remains. 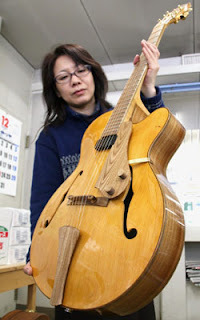 The archtop-style guitar was completed in October 2009 and has been played by a number of local musicians in Shimokawa. With a fallen historic tree that large I would think that they would have managed to knock out a few additional solidbodies like this hand-carved Ibanez Artwood Nouveau from the mid-70s.